More than a Quarter Century of MS Walking! 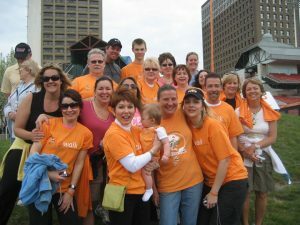 Your ChangeMS.org blog administrator Kristin Abramowitz reached out to me recently seeking my reflections on Walk MS. I thought that was a good idea, since I am one of the few people in Western New York who has participated in every year of these fundraising walks – except for the very first one! I’ve seen sunshine, rain, frost, snow, and hundreds and hundreds of determined, caring walkers over the past quarter century doing what they can to help find treatments and, one day, a cure for Multiple Sclerosis. I’ve been in touch with Tom Hagerty, former assistant and volunteer in the local office of the National Multiple Sclerosis Society. Tom puts the date of the very first MS walk at April 1, 1990. Tom knows because he was there and remembers the weather was rainy and terrible. He also recalls that was the first and last year the Walk started at the UB Dental School on the South Campus. 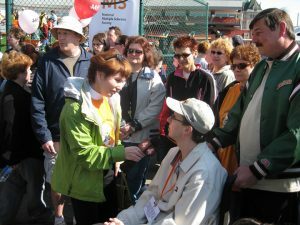 Back then it was called the Super Cities Walk and there had been other MS fundraising walks under that name in Canada. I recall the Super Cities name as well, because I still have a sweatshirt bearing that name. It’s a memento from my very first MS walk in 1991. And, I can say with confidence that from that date, Channel 4 has always been a strong supporter and sponsor of events by the National Multiple Sclerosis Society. As managers have come and gone over the decades at WIVB-TV, I’ve made it my mission to educate each one of them about the importance of supporting efforts to fight MS. Each has learned about the high rate of MS in Western New York and our obligation to support those who live with Multiple Sclerosis. That 1991 walk started at the UB Clark Gym and I recall recording a Channel 4 promotional announcement for it along with Meteorologist Chuck Gurney. I believe we videotaped it on the steps of the Albright Knox Art Gallery because Delaware Park was part of the walk route. Unless they show up on YouTube, promos like that are long gone now. I don’t have a copy, I’ve lost touch with Chuck, and everyone who worked in the Ch. 4 promotions department back then has gone on to other ventures now! The Super Cities Walk, the MS Walk, and Walk MS – no matter what it has been called over the years – has always been the biggest fundraiser for the local chapter of the National Multiple Sclerosis Society. Generally, people collect pledges, a certain amount of money, for each mile that they walk. That money has helped make tremendous strides in finding new treatments for the chronic, often disabling disease of MS. I recall when I first started working with the National MS Society more than 30 years ago there was only one treatment available for those living with MS – steroid infusions that required a hospital stay. Today there are approximately 14 medications and other treatment methods. Nothing is perfect and there is no cure – but there are choices available now because of the money that has poured into research over the past 30 years. People are walking, working, and enjoying their families today who wouldn’t have been able to do that without the fruits of this research. Memories from these dozens of Walks fly by for me – I loved the hubbub and balloons that used to mark our path outside the UB Clark Gym with hot dogs sizzling on the grill, street scenes of vibrant neighborhoods with North Buffalo neighbors who gave us a wave, the thrill of scouting out exotic animals as we traipsed through the Buffalo Zoo in Delaware Park, the unique view from the outfield of Coca-Cola Field in downtown Buffalo, and the breathtaking sight of the USS Little Rock as we stepped off on our route most recently from the wooden walkway at Canalside. 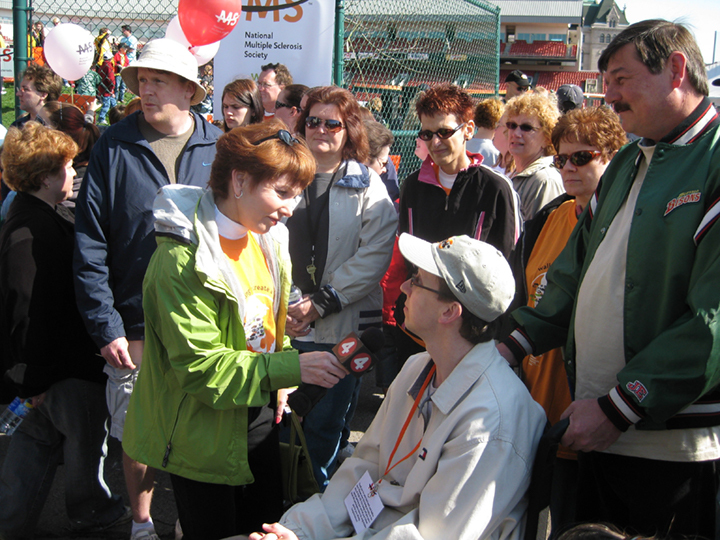 Yes, the location for Walk MS has changed over the years, but the warm embrace from Western New York for this special event has always spelled success. My participation in so many MS Walks has given me the opportunity to connect with a host of inspiring Western New Yorkers who have MS – people like Kristin and Tom, Wendy Cannon, Rich Warden, and Joey Marra, to name just a few. I look for these familiar faces each year as I look forward to catching up with the changes in their lives – hopefully always for the better. It is heartening to see the teams of friends, family, and co-workers who rally around those who MS, lifting them up in spirit, and contributing to the cause. So many people want to help their loved one who has been diagnosed with Multiple Sclerosis – and raising pledge money to participate in a short walk is one way that appeals to thousands of Western New Yorkers each year. I say short walk because there has always been the one mile walk available to participants. Most of those who join us, whether they are using a chair, a walker, or their feet, are able to navigate the one mile course. I’ve done the one mile, the five mile, and one memorable year I completed ten miles! I’ll never forget that former Executive Director Art Cardella paired me up with one of the Walk co-chairs saying it would be good for me to get to know this prominent businessman. I had no idea he was headed for the ten-mile course until we passed the infamous ‘fork in the road’ pointing toward the 5 mile route. We finished all ten miles and I certainly got to know more about my walking partner, but trust me, never ten again! Walk MS this year is on Saturday, May 6 at Canalside. Cross your fingers for blue sky and sunshine that day because there is no question that nice weather brings a bigger turnout. Extreme weather is not a friend to people who live with MS and they are less likely to be able to join us in poor conditions. And, of course, it’s hard to roust family members out of bed on a Saturday morning if it’s raining, sleeting, or snowing! Take it from someone who has walked this Walk for 27 years with my husband and my two boys who have now grown up and moved beyond Western New York: you will feel better both physically and mentally by experiencing the joyful vibe of your fellow walkers. Whether you collect pledges, donate your own money, or volunteer to help keep things moving, it’s one thing – one simple thing — you can do, step by step, to push us closer to the goal we are all seeking: a cure for Multiple Sclerosis. I hope to see you at this year’s Walk MS!